The latest issue (91) is out now and here's a taster of what is inside . . .
RICHARD BOTT catches up with Tony Briggs, who recalls the painful aftermath of his career-ending crash and explains why helping current riders to avoid a similar fate – and worse – has enabled him to make an indelible mark on the sport his famous father once dominated. In the second half of our main feature . . .
How hard must it have been for Tony Briggs to follow his world famous father? 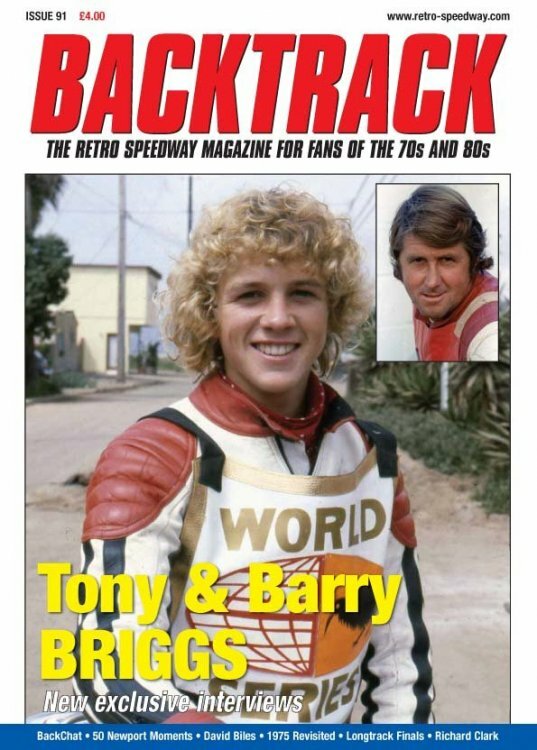 TONY McDONALD put the question to the legendary Barry Briggs, who shines an insightful light on the obstacles that he is convinced hampered his son's speedway ambitions. Introducing a regular new feature where you, our readers, have the chance to fire questions at our lead columnist. As one of the most respected promoters and administrators of the Backtrack era, no-one is better qualified to respond to questions about the burning issues of the 70s and 80s. Among subjects up for debate this time are the effects of the four-valve revolution, promoters who benefited from dual track interests, second-halves and the BSPA's World Final share-out. MR also reflects on what he considers to be the promoters' decision he most regrets from his time in the sport. ANDREW SKEELS turns the clock back some 44 years to another great summer for the mighty England team. He also recalls how track conditions overshadowed Ole Olsen's second world title success and why new and returning teams helped the two domestic leagues to thrive. One of the most popular riders in Poole's National League era and also a young star at Weymouth, David Biles tells PHIL CHARD why he was a reluctant hero and decided to quit while still a star heat leader at 22. ROB PEASLEY looks at the South Wales club that was at the heart of the four-valve revolution in Europe, led by Australian great Phil Crump at a much-maligned track that even some of the world's best didn't relish visiting. Wasps and Dragons favourites featured include Torbjorn Harrysson, Sandor Levai, Tommy Johansson, Neil Street, Reidar Eide, Phil Herne, Steve Gresham, Brian Woodward, plus NL stars Mike Broadbank and Jim Brett and those who were prominent in the last era at Hayley Stadium in Queensway Meadows from 1997 until the club's sad demise in early 2012. DOUG NICOLSON looks at speedway's 'lifers', riders of the 70s and 80s who spent their entire career at just one track. Such loyal one club men include Bernie Leigh, Les Owen, Martin McKinna and Mike Caroline, plus those who rode for different clubs but under the same promotion – the likes of Eric Boocock and Norman Storer. There is much more to the long-serving former editor of Speedway Star than denim jeans, a thirst for Guinness and a carrier bag full of vinyl Bob Dylan albums. In this first of a fascinating two-part interview, TONY McDONALD traces Clarkie's path from school rebel to Star man. In part one of our review of speedway's 'bigger brother', ROB PEASLEY looks back at the early history of the FIM competition won by some of tracksport's all-time greats. Ivan Mauger, Ole Olsen, Anders Michanek, Egon Muller and Alois Wiesbock all claimed the 1,000 metres title in the decade under review.